From the tarnished ashes of Internet Explorer came Microsoft Edge, an all-new browser built from the ground up for Windows 10. When we first went hands-on with the browser – then still called Project Spartan – we thought it brought some interesting concepts to the table, but it was much too buggy and sparse on features to replace daily drivers like Chrome or Firefox. 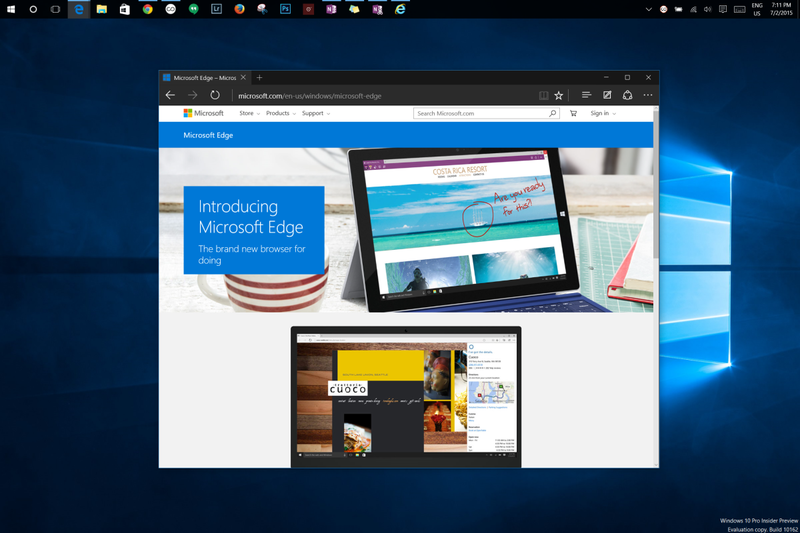 This week however, Microsoft finally showed us a more complete version of the browser, as it adopted the new Edge branding and prepared to take on the big names – and it might just have a shot. The first thing you notice after a couple of minutes messing around with Edge – besides the option for a cool new dark theme – is how smooth scrolling through pages is. Windows gets a bad rap for not being able to match the trackpad experience you find on Macs, but if the performance in Edge is any indicator, it may be that software is to blame more than hardware. Scrolling through webpages (whether with the trackpad or the touchscreen) was as stutter-free as I’ve seen on any device on my Surface Pro 3. It could be that Microsoft’s new universal app standards are helping out here. Internet Explorer (which is still pre-installed in the preview builds on Windows 10) is actually very smooth to scroll around as well, but it’s still a step behind. Chrome, Firefox, and Opera are nowhere close. If you use a convertible computer, Edge makes the transition between laptop and tablet modes seamless. The smooth performance applies to loading webpages as well. This build of Spartan is free of almost any of the web rendering glitches I often found with Internet Explorer (Google Docs actually works! ), and it seemed to load pages at least as quickly as anything else I have installed. Moreover, I can also actually stream 1080p and even 4K video without a hitch, and I consistently get a couple more hours of battery life with Edge than with Chrome (though Chrome has a infamous tendency to drain batteries). The only thing Edge is really missing right now is an extensions platform. A lot people rely on extensions for their day to day browsing, but Microsoft has promised they’re coming soon enough — it’s only a matter of time. In the meantime, the browser keeps its light weight despite a fair amount of core features. The distraction-free reading mode from the first builds is still in tow, while the Web Note annotation tool is a great option for tablet users and students. The search bar is also more functional than in other browsers, providing direct answers to queries such as the weather without opening up a search engine, while Cortana integration makes it easy to get answers about on screen text without interrupting your browsing session. There are still some bugs here and there that will presumably be ironed out before launch – it sometimes glitches out when opening tabs in a new Window, for instance, and I can’t switch from Bing to Google search yet. But even with the rare pre-release bug, the core browsing experience in Edge is more gratifying than on its competitors, and that means it won’t immediately compel people to install a new browser as soon as they buy a new computer. If that’s not a success for Microsoft after years of dwindling Internet Explorer use, I don’t know what is.